Circular itinerary through a unique rural landscape of great beauty, which is worth discovering, unhurried, along asphalt and dirt roads, under the imposing presence of the Montgó. LENGTH: 6 km. Circular route. DURATION: On foot: 1 h 40 min. Bicycle: 35 min. What most calls one's attention during this route is the rural architecture, example of the human footprint during the development of this rural setting. Until quite recently, the customs and way of life associated with subsistence agriculture continued to be preserved. The Montgó appears with a different face, offering an especially beautiful image when the flowers of nearby almond groves are in blooms, behind which it rises as a natural backdrop. Bursting colours in contrast, magnifying the charm of the path along which the route runs. The protected agricultural zone around the mountain forms an unknown composition of great beauty just a few minutes away from the overdeveloped coastline. Senyoret Riurau, church and convent of Jesús Pobre, Cases Noves rural houses, cypresses at the cemetery (see comment, Route 9), Millenary Olive Tree. Simple, yet surprising one-storey, open-plan, rectangular, narrow and long building with a gable roof. Its two façades have arches and pillars facing one another. After years of deterioration, it was restored in 2010 and brought back to its full splendour. The riuraus were used for agricultural tasks, mainly in the elaboration and drying of raisins after first scalding the grapes. Laid out upon reeds, they were protected from dew during the night. The building dates back to the middle of the 19th century, and is one of the largest riuraus of the Marina Alta region. Currently, it is a public space used for cultural events. Its surroundings also have benches, trees and a fountain, enticing us to rest along the route. Just metres away is the Plaza of the Convent, another pleasant and charming space that houses the Jesús Pobre church and convent. The Millenary Olive Tree (Olea europaea) is found just when we cross the town of Jávea, at the feet of the Montgó, making an impact with its spectacular dimensions. Its silhouette has grown imperceptibly but continuously since more than 800 years ago. Since Muslim times, it is the rested witness of the presence of man and historical changes that took place in its surroundings. Its perimeter, measured at a height of 1.3 m from the ground, is 9.3 m. It stretches upwards 7 m.
A living sculpture reigning over an unknown agricultural landscape, it is well worthwhile to seek shade under its arms to be pleasantly relaxed, remaining a few minutes in silence, feeling inspiration and tranquillity. Saying goodbye to such a grandiose living being by hugging its trunk unhurried may allow us to perceive its silent heartbeat, in unison with our own. 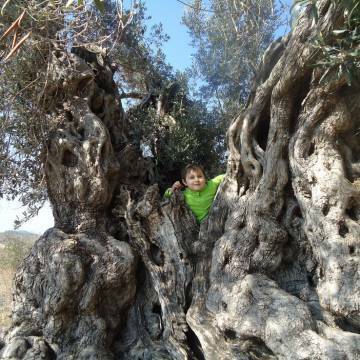 A majestic carob tree keeps the Millenary Olive Tree company.